The department offers programs leading to the master of arts (MA) and doctor of philosophy (PhD) degrees. There is also a joint PhD program in applied mathematics with The University of Alabama system campuses at Birmingham and Huntsville. This page provides general information about coursework, preparation, and degree requirements for graduate programs in the math department. 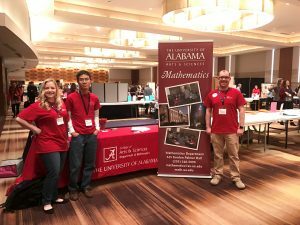 In addition to the pages of this website, you can read about the graduate programs in math in the UA Graduate Catalog. Prospective students should visit our page for prospective graduate students. The University offers an Accelerated Masters Program (AMP) for students who wish to earn a Master’s degree while also studying as undergraduates at the University. Courses are available in the following areas: algebra, analysis, topology, differential equations, mathematical methods for engineering, numerical analysis, mathematical statistics, fluid dynamics, and optimization theory. For University rules regarding transfer credit, residency requirements, and other policies and deadlines, refer to the Graduate Catalog and the Graduate Academic Calendar. The requirements summarized here are covered more fully in the UA Graduate Catalog. You should also consult the current catalog for complete information about University policies. The Math Graduate Handbook has more detailed information about requirements. If University degree requirements happen to change during your stay at the University, you will be subject to the rules that were in force when you first enrolled, not to the new rules. Changes made at the departmental level, however, may work retroactively, depending on the circumstances. Every graduate student must maintain a grade point average of “B” or better. A student whose grades drop below a “B” average will be placed on academic probation. According to University regulations, a probationary student who cannot return to a “B” average within the next 12 hours of graduate work will be dropped from the program. Furthermore, in order to graduate, at least 75 percent of the credit hours that are counted as part of the requirement for the degree and approved by the Graduate Advisory Council must be completed with a grade of “B” or better. You must meet with your advisor before each semester to ensure that you are following a suitable program of study. A complete list of courses offered is in the Graduate Catalog. The Graduate School requires all students for an advanced degree to submit an “Admission to Candidacy” form. All students must submit an “Application for Degree” through their myBama portal. This application must be approved by the end of the registration period for the semester in which the student expects to graduate. If a student fails to graduate that semester, a new application for degree form must be submitted.